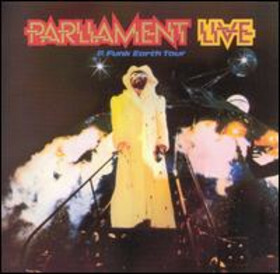 Live: P-Funk Earth Tour is a 1977 Parliament live double album that documents the band's P-Funk Earth Tour of that year. The performances include songs from Parliament's albums through The Clones of Dr. Funkenstein as well as songs from the Funkadelic repertoire. The album is made up of portions of two performances from January 1977 at the Oakland Coliseum and the Los Angeles Forum. The track "The Landing (Of The Holy Mothership)" is a musical montage that mixes clips of various P-Funk recordings with broadcast news-style commentary from George Clinton. The original vinyl release contained a 22 × 33" inch poster of George Clinton dressed as Dr. Funkenstein, as well as an iron-on t-shirt transfer that boasted the slogan "Take Funk To Heaven in '77!". "Parliament Live" became the group's third album to be certified gold.